One of the things about starting a travel blog is that it opens your eyes to things you have never considered. I first came to Melbourne more than twenty years ago, and since then have been back multiple times. Usually I would come here to do some shopping or to see a sporting event, and rarely have I looked at the city from the point of view of a traveller. During my most recent visits though I have been on a mission. Visiting does not have to be expensive, and I was out to find the best free things to do in Melbourne. Here’s what I have come up with so far, and I hope to get back there again soon to add even more to the list. Cathedrals and other places of worship are always popular when visiting a new place. They tend to be beautiful, and the Cathedrals of Melbourne are no different. St Paul’s Cathedral is to be found right near Flinders Street Station and Federation Square so is easy to visit. 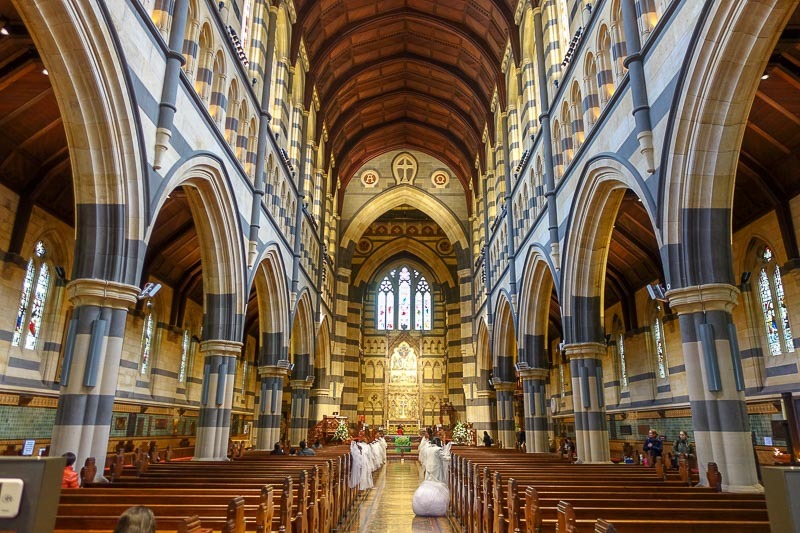 St Patrick’s can be found behind Parliament House, or visit St Francis on Lonsdale Street, the oldest Catholic church in Melbourne. My favourite thing to do when I land in a new city is to take a free walking tour. This is always a great way to get my bearings, and it gives me access to a local who is generally more than happy to answer any silly little questions I may have. It’s generally a great way to get hints and tips about attractions, getting around and where to eat too. Melbourne has many different walking tours available at different times of the day so choose one that leaves from a location near you at a convenient time. This is the one I took, and I was very happy with it. If you are interested in the Victorian parliamentary process, or if just like me you want to be nosy and just see what the building looks like, Parliament House runs various free tours on days when the government is not sitting. 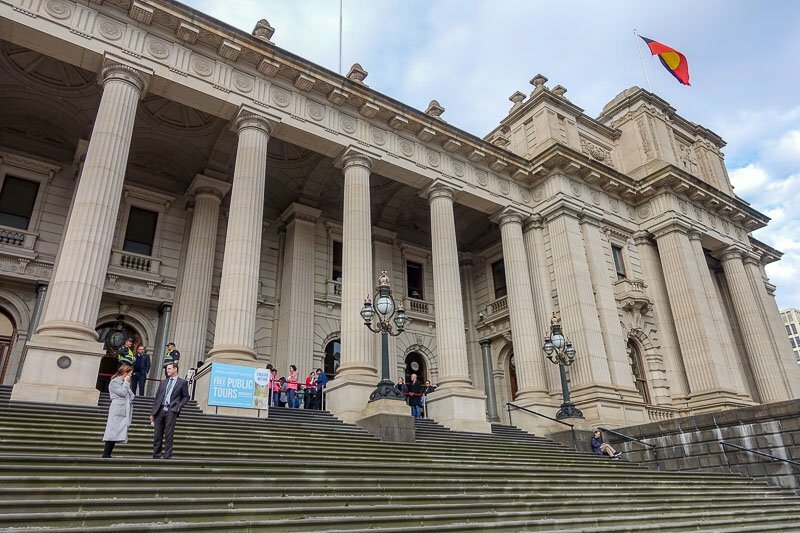 For information on whether or not the tours are running, have a look at the Parliament of Victoria website. I recommend arriving about twenty minutes before the tours as in my experience the tours fill up as they have limited numbers. Right near Flinders Street Station there is a large open are called Federation Square. You can also spot it by the unusual-looking buildings surrounding it. The area is edged with cafes and bars and is often the location for outdoor events. There is a huge outdoor screen, and if you don’t have tickets, it’s likely major sporting events (such as the AFL Grand Final or the Australian Open tennis) will be shown live here. 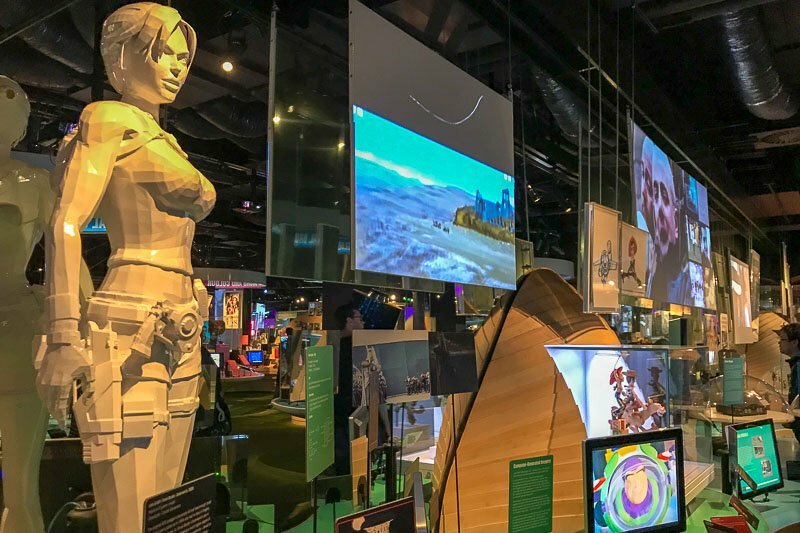 Accessed from Federation Square, ACMI (Australian Centre for the Moving Image) is all about the screen, both big and small. It covers everything from the science and history behind film and tv, to well known Aussie actors and programs. There are paid exhibitions here too, but you could easily spend an hour or two here just looking through the free sections. If you have a passion for art call into the National Gallery of Victoria on St Kilda Road for some of the best artworks in Australia. Even those not into art – like me – will enjoy spending some time wandering through the huge galleries. you will find world class paid exhibitions and events happening year round if you are looking to see some special artworks. Make sure you check out the beautiful ceiling in the relaxation area. If you don’t want to make your way down St Kilda Road to the NGV or you are short on time, you can instead pop into the Ian Potter Centre in Federation Square. 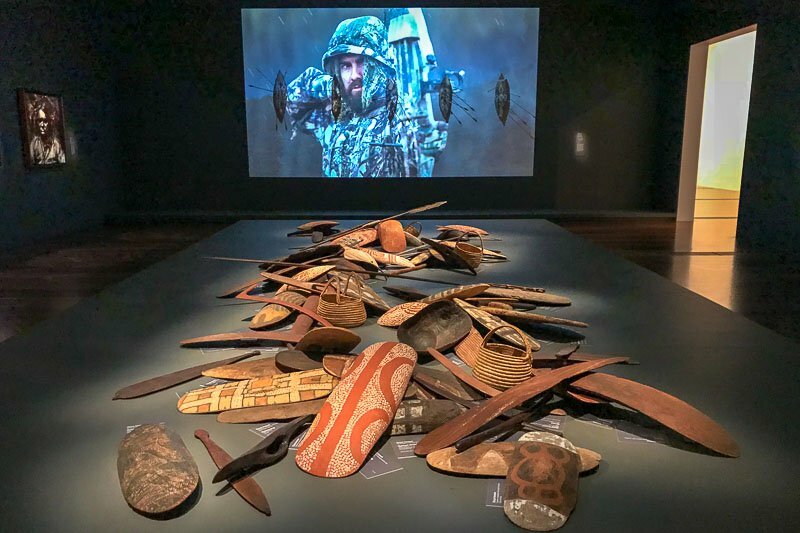 Also curated by the NGV, this is where you will find all of the Australian artworks, both indigenous and non-indigenous. Not too many cities can boast about having a free animal encounter right near the centre, but in Melbourne you can make your way down to St Kilda by tram, then walk out onto the breakwater to watch the little penguins come in from their day at sea as the sun goes down. As always, remember these are wild animals and leave them well alone, or else they might not be here in a few years time. While in St Kilda, why not do a walking tour in this area too? Find out about the history of the area, see Luna Park and learn about the penguins. The tours take place late afternoon, finishing at the end of the pier just in time for sundown. Almost everyone you talk to about Melbourne will tell you to go and look at the street art. 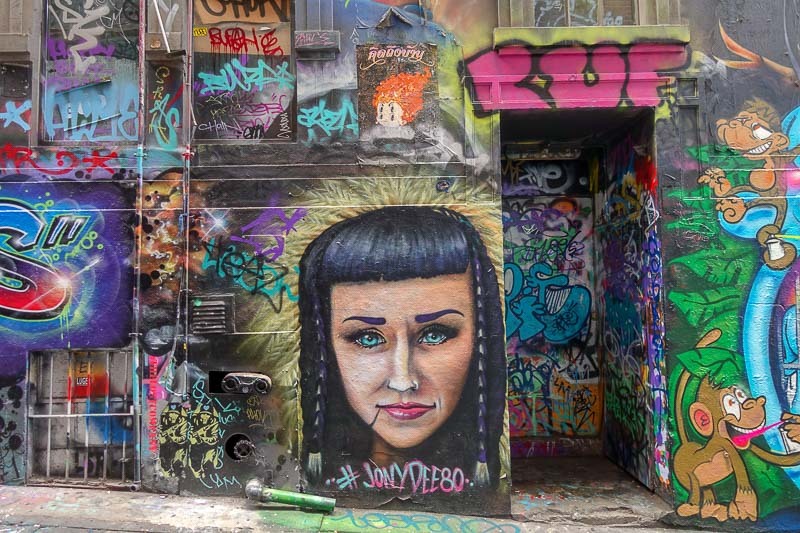 Hosier Lane is probably the most popular, and I still think you should call past for a look, but in my opinion you will find better artworks in some of the other laneways such as AC/DC Lane and Croft Alley. Often the artwork is short lived, so a visit to the laneways is different every time. There is artwork to be found all over though, so keep your eyes open as you walk around and you may come across some great murals. 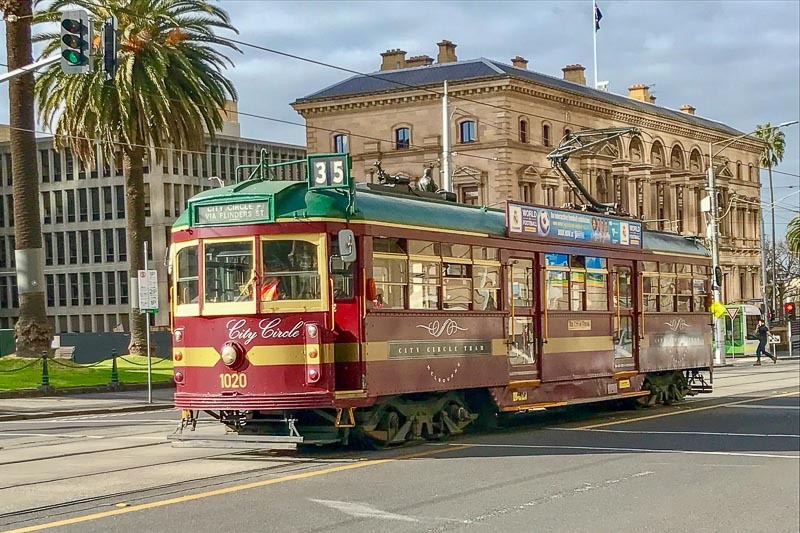 While all trams are free within the Melbourne city centre, the free City Circle Tram does a loop around the outside of the city and provides tourism commentary as it travels around. This is a great way to get your bearings when you first arrive in the city, and it can also help you find some other things to do during your stay. The Queen Victoria Markets have a little bit or everything, from clothes and souvenirs to fresh food to stalls selling food to go. At some times during the year there is also a night market.Check out the times the various parts of the markets are open here before you go. Another attraction in Federation Square is the Koorie Heritage Trust Cultural Centre. Here you are able to see some modern creations by the local indigenous people. The centre also provides some information about the Aboriginal people of the area. 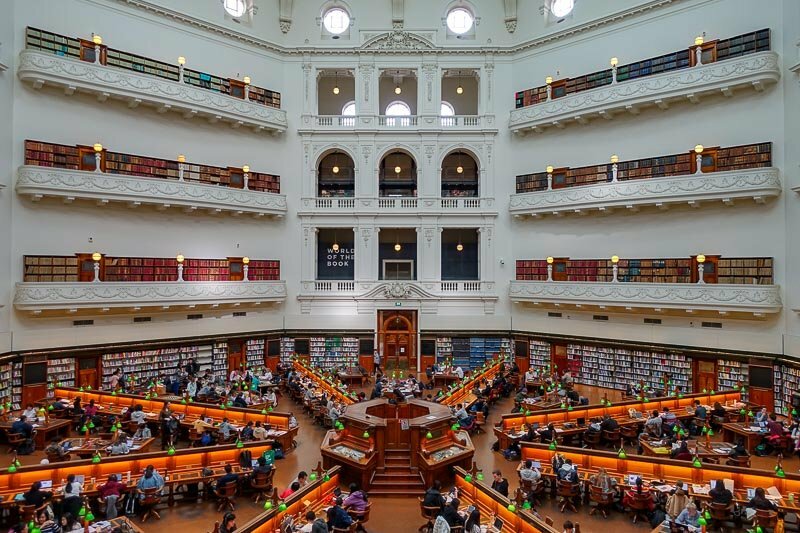 The State Library Victoria is more than just a building that holds books. The La Trobe Reading Room is a stunning space full of light and alone is worth a quick peak. The library also holds displays of old books, and has some great historical information on the state of Victoria, including the armour of Australia’s most infamous bushranger, Ned Kelly. If you would like to find out more about the library (or Ned Kelly) they regularly run free tours, but you will need to book in advance. The library is also a great place to stop into if you need power to charge your phone and some free wifi. Melbourne has a thriving music scene and the Cherry Bar on AC/DC Lane is popular for it’s live gigs. Some well known bands have a cover charge, but there are a few nights each week where fresh new bands play and entry is free. Check out their website to find out who is playing during your visit. If rock music is not your thing, then perhaps you would prefer a comedy night. Every night it is possible to find somewhere in Melbourne offering stand up comedy for free. Often these are up and coming artists, but every now and then a well known name can be found at one of the venues. Head on over to this website to see a list of venues. If the sun is out and you need an escape from the hectic city centre, head over to the other side of the Yarra River and visit the Royal Botanic Gardens. Relax with a picnic or just stroll along the many paths. 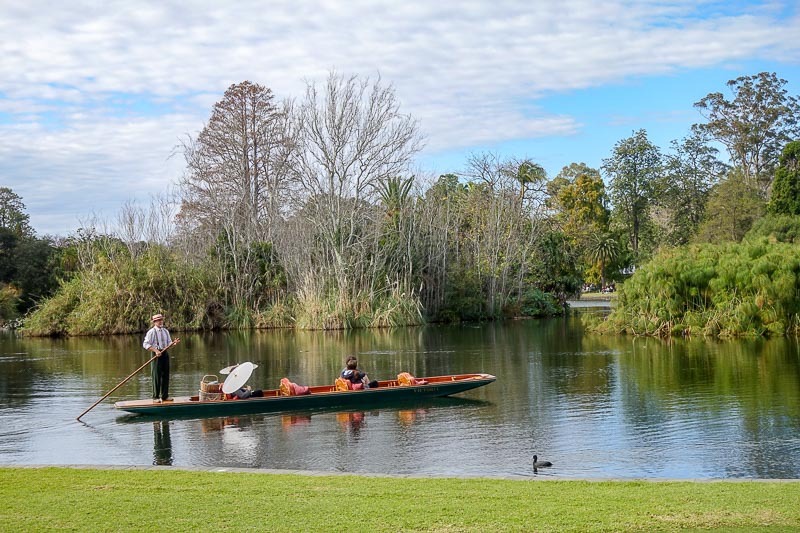 You could even take a boat ride on one of the lakes. 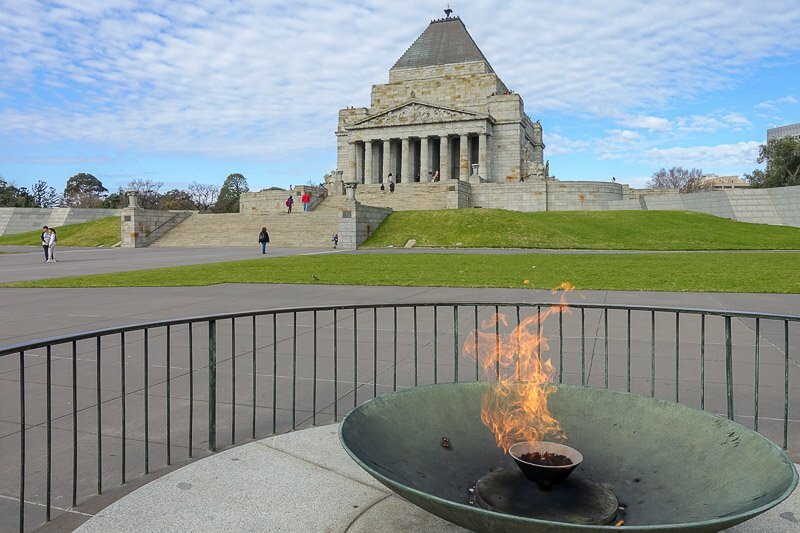 Near the Royal Botanic Gardens is the Shrine of Remembrance, the Victorian war memorial. Here you can learn a little about the history of wars that Australia has been (and still is) involved in. Climb to the top of the shrine to get some fabulous views over the city centre on one side and towards the ocean on the other side. The Old Treasury Building is one of the most beautiful old buildings in all of Melbourne. You can visit here to learn and the history of the Victorian gold rush, as well as other artworks and temporary exhibitions. It’s still possible to visit the old gold vaults too. Entry is free, but tours are also offered once a day for a small fee if you would like to learn more. 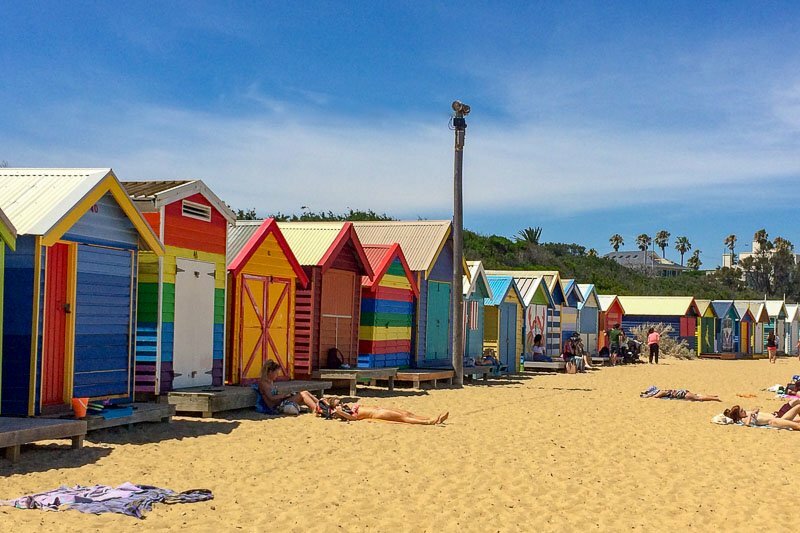 Take an afternoon to catch the train to Brighton Beach to enjoy the sun and check out the colourful beach boxes that are dotted along the shore. Don’t get it wrong like I did though, read my post of the right way to see the beach boxes here. If you are strolling along the South Bank area after dark, keep your eyes out for a fireball show that occurs on the hour until late in the evening. Take a look at the website here for the exact times. 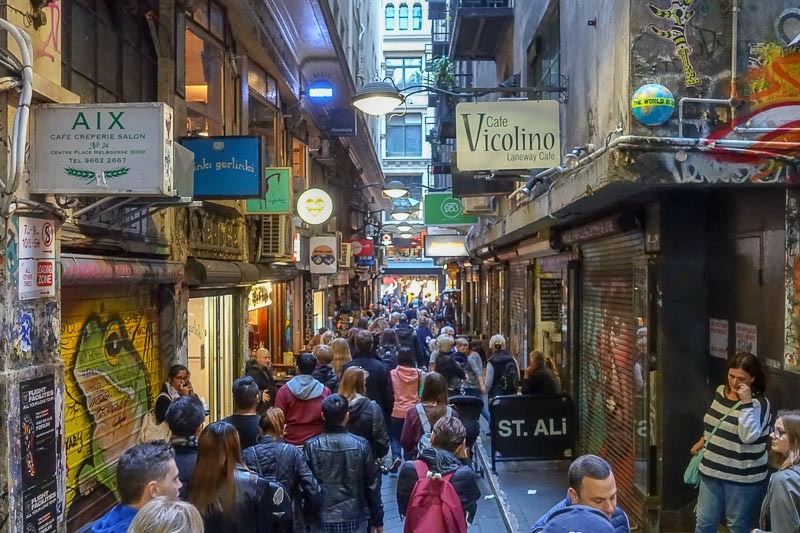 Another one of the things you have likely heard about Melbourne is about the laneways. Throughout the city centre you will find many little laneways (outside) and arcades (inside) that are filled with small cafes and bars and are the perfect spot to stop for lunch or a coffee. Some of the arcades are still decorated just like they were in their previous heydays. For a real treat check out Hopetoun Tearooms in the Block Arcade. Just browsing the amazing cakes in the window will make your mouth water. For the absolute best views over Melbourne you cannot go past the Eureka Skydeck – but those views are not free. There are a couple of options to see the skyline for free. Firstly try the Sofitel Melbourne on Collins Street. Make your way up to the lobby bar on the 35th floor. You can pay to have a coffee or enjoy a meal, but you could just sneak a peek at the view too. Strangely the best views are found in the bathrooms – I’ve been told the mens is the best! The second place is the Rialto at the other end of Collins Street. You can make your way up to the Lui Bar on the 55th floor. Unfortunately it was closed when I tried to visit, so I can’t comment on how easy it is to sneak a peek at the view without buying a cocktail or a glass of wine. Could be a great place to pop in to enjoy a drink as the sun goes down. A third popular location just a short tram ride outside the city centre is the rooftop bar at “Naked for Satan”. Here you can look back at the city centre and see the whole skyline. Visit on a Sunday night when all tapas plates are $9AUD for a cheap meal. Okay, so this one is not free, but if you have a few hours free why not call into Halftix at the Melbourne Town Hall and see what shows are available. They sell heavily discounted tickets, but only ones that are for the current day or the next day. What is available depends on which shows have unsold tickets, but sometimes you can also find short tours as well. To see what is available today, here’s the website, but remember you do have to actually go to Halftix to purchase the tickets at these prices. Still looking for the best way to get from Melbourne Airport to the city centre? Read my post on Melbourne Airport Transfers here. For accommodation I recommend Booking.com. Click through to the website here to find your best deal. Visiting Sydney too? Click here if you are looking for some free things to do in Sydney. After all these free things you now have money to burn? Have a look at these suggestions. Like these ideas? Pin this for later. The State Library looks so cool! The wifi is obviously a nice feature too haha, great post! Thanks for the great suggestions!! I’m a sucker for indigenous art! Thanks Alexa. 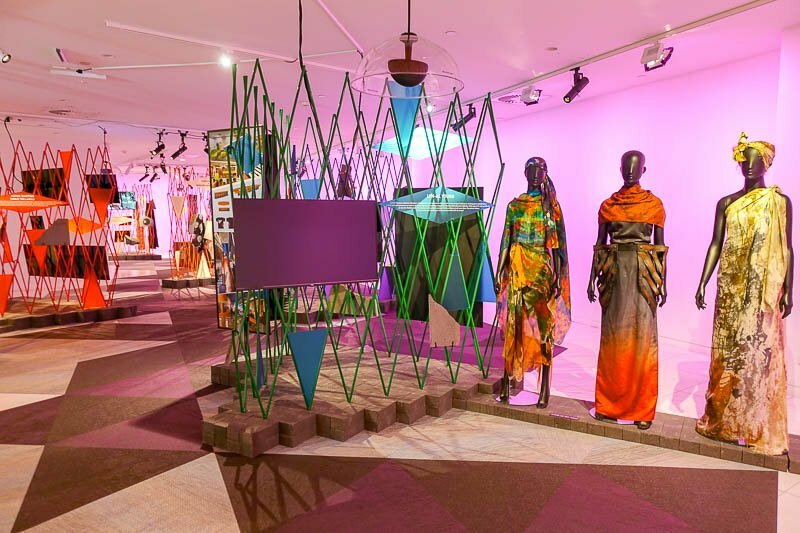 Check out the Ian Potter Centre when you are in town then – some fantastic pieces in there. Wow, looks amazing. Planning to visit Melbourne coming year. Enjoy! Even though it’s hard as a South Australian to admit (state rivalry and all that) Melbourne really is a great city and I just love visiting there over and over. Thanks Emma, I’m sure you will have a ball. Melbourne has something for everyone! 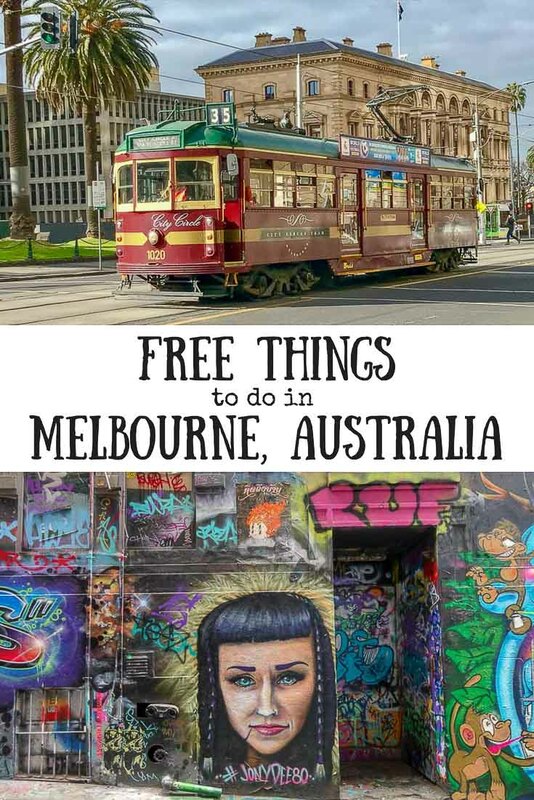 Ooh I could be headed to Melbourne in a few months so I’m definitely going to take advantage of these fun free things! Street art looks fun Will have to see it. Good list of things to do. Thanks Sue. Melbourne is well known for it’s street art and there really are some fantastic pieces around the place. It would be easy just to spend a whole day looking around the city centre at it all. Thanks Brenda. Glad to be endorsed by a local! Thanks for your comment. I hope you get to Melbourne some day to test them out.